The earliest people were nomads who moved from place to place to hunt animals and gather plants. After the last Ice Age ended, Earth's temperatures rose. As the climate warmed, many nomads moved into areas with a mild climate and fertile land. Another historical revolution then occurred. For the first time, people began staying in one place to grow grains and vegetables. Gradually, farming replaced hunting and gathering as the main source of food. At the same time, people began to domesticate (duh • MEHS • tih • kayt), or tame, animals for human use. Animals transported goods and provided meat, milk, and wool. This change in the way people lived marked the beginning of the Neolithic Age (nee • uh • LIH • thick). It began about 8000 b.c. and lasted until around 4000 b.c.—about 4,000 years. The word neolithic is Greek for "new stone." Calling this time period the New Stone Age, however, is somewhat misleading. Although new stone tools were made, the real change in the Neolithic Age was the shift from hunting and gathering to systematic agriculture. This is growing food on a regular basis. This shift from hunting and gathering to food production, however, did not happen quickly. 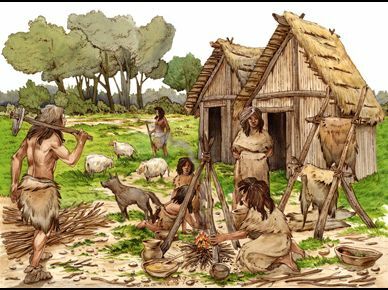 Even during the Mesolithic Age, or Middle Stone Age, some people continued to hunt and gather, while others began to grow their own food. Historians call this settled farming during the Neolithic Age the Agricultural Revolution. The word revolution refers to any change that has an enormous effect on people's ways of life. While hunter-gatherers ate wild grains that they collected, early farmers saved some of the grains to plant. Humans lived differently once they learned how to grow crops and tame animals that produced food. They now could produce a constant food supply. This allowed the population to grow at a faster rate. Nomads gave up their way of life and began living in settled communities. Some historians consider the Agricultural Revolution the most important event in human history. By 8000 b.c., people in Southwest Asia began growing wheat and barley. They also domesticated pigs, cows, goats, and sheep. From there, farming spread into southeastern Europe. By 4000 b.c., farming was an established economic activity in Europe. At about the same time, around 6000 b.c., people had begun growing wheat and barley in the Nile Valley in Egypt. Farming soon spread along the Nile River and into other regions in Africa. In Central Africa, different types of crops emerged. There, people grew root crops called tubers, which included yams. They also grew fruit crops, such as bananas. Wheat and barley farming moved eastward into India between 8000 and 5000 b.c. By 6000 b.c., people in northern China were growing a food grain called millet and were domesticating dogs and pigs. By 5000 b.c., farmers in Southeast Asia were growing rice. From there, rice farming spread into southern China. In the Western Hemisphere, between 7000 and 5000 b.c., people in Mexico and Central America were growing corn, squash, and potatoes. They also domesticated chickens and dogs. During the Neolithic Age, people settled in villages where they built permanent homes. They located villages near fields so people could plant, grow, and harvest their crops more easily. People also settled near water sources, especially rivers. Neolithic farming villages developed throughout Europe, India, Egypt, China, and Mexico. The biggest and earliest known communities have been found in Southwest Asia. One of the oldest communities was Jericho (JAIR • ih • koh). This farming village grew in an area between present-day Israel and Jordan called the West Bank. The village of Jericho was well established by about 8000 b.c. It extended across several acres. The area of sun-dried-brick houses was surrounded by walls that were several feet thick. Another well-known Neolithic community was Çatalhüyük (chah • tahl • hoo • YOOK) in present-day Turkey. Although little evidence of the community remains, historians know that between 6700 and 5700 b.c., it covered 32 acres and was home to about 6,000 people. The people lived in simple mud-brick houses that were built close together. What if, instead of a front door, your house had a roof door? In Çatalhüyük, the houses did not have front doors. Instead of going through a door in the wall, people entered their homes through holes in the rooftops. They could also walk from house to house across the roofs. People decorated the inside of their homes with wall paintings. In addition to homes, Çatalhüyük had special buildings that were shrines (SHREYENZ), or holy places. These shrines were decorated with images of gods and goddesses. Statues of women giving birth have also been found in the shrines. Both the shrines and the statues show that the role of religion was growing in the lives of Neolithic people. Farmers grew fruits, nuts, and different grains on land outside Çatalhüyük. People grew their own food and kept it in storerooms within their homes. They raised sheep, goats, and cattle that provided milk and meat. They ate fish and bird eggs from nearby low-lying wetlands called marshes. Scenes drawn on the walls of the city's ruins show that the people of Çatalhüyük also hunted. What Were the Benefits of a Settled Life? Neolithic people needed protection from the weather and wild animals. A settled life provided greater security. Steady food supplies created healthier, growing populations. As the population increased, more workers became available. Those individuals could grow more crops. Villagers produced more than they could eat, so they began to trade their food for supplies they could not produce themselves. Because an abundant amount of food was produced, fewer people were needed in the fields. Neolithic people began to take part in economic activities other than farming. Specialization (speh • shuh • leh • ZAY • shun) occurred for the first time. People took up specific jobs as their talents allowed. Some people became artisans, or skilled workers. They made weapons and jewelry that they traded with neighboring communities. People made pottery from clay to store grain and food. They made baskets from plant fibers. They also used plant fibers to weave cloth. Ötzi, the Neolithic Iceman, wore a cape made from woven grass fibers. These craftspeople, like farmers, also exchanged the goods they produced for other things they did not have. The roles of men and women changed when people moved into settlements. Men worked in the fields to farm and herd animals. They gradually became more responsible for growing food and protecting the village. Men emerged as family and community leaders. Women bore the children and stayed in the villages. They wove cloth, using the wool from their sheep. They also used bone needles to make clothing from cloth and animal skins. In addition, women managed food supplies and performed other tasks. The growth of communities did not always bring benefits. In some places, such as settlements in present-day Jordan, rapid population growth caused resources such as wood supplies to be used up quickly. On occasion, this loss of forestation caused desert-like conditions to spread. Where this type of ecological damage occurred, many settlements were abandoned. During the late Neolithic Age, people made more technological advances. Toolmakers created better farming tools as the need for them arose. These included hoes for digging soil, sickles for cutting grain, and millstones for grinding flour. In some regions, people began to work with metals, including copper. Workers heated rocks and discovered melted copper inside them. They then experimented with making the copper into tools and weapons. These proved to be easier to make and use than those made of stone. Craftspeople in western Asia discovered that mixing copper and tin formed bronze. This was a technological breakthrough because bronze was stronger than copper. Bronze became widely used between 3000 and 1200 b.c. This period is known as the Bronze Age. Few people, however, could afford bronze and continued to use tools and weapons made of stone. Humans continued to develop more complex cultures, or ways of life. By the beginning of the Bronze Age, communities were widespread. More complex cultures called civilizations began to develop in these communities. Four of the great river valley civilizations—Mesopotamia, Egypt, India, and China—emerged around 3000 b.c. All civilizations share similar characteristics. One characteristic of these early civilizations was that they developed cities and formed governments. The first civilizations developed in river valleys, where fertile land made it easy to grow crops and feed large numbers of people. The rivers provided fish and water. They also encouraged trade, which allowed the exchange of both goods and ideas. The cities that developed in these valleys became the centers of civilizations. People formed governments to protect themselves and their food supplies. In these early civilizations, the first governments were monarchies. A monarchy is a type of government led by a king or queen. Monarchs created armies to defend against enemies and made laws to keep order. They also appointed government officials who managed food supplies and building projects. Religions emerged in the new civilizations to help people explain their lives. For example, religions helped explain the forces of nature and the role of humans in the world. Early people believed that gods were responsible for a community's survival. Priests performed religious ceremonies to try to win the support of the gods. Rulers claimed that their own power was based on the approval of the gods. Early civilizations had social class structures. That is, people in society were organized into groups. These groups were defined by the type of work people did and the amount of wealth or power they had. Generally, rulers and priests, government officials, and warriors made up the highest social class. They set the rules and made the important decisions. Below this class was a large group of free people, including farmers, artisans, and craftspeople. At the bottom of the class structure were enslaved people, most of whom were captured from enemies during war. To pass on information, people invented ways of writing. These early systems used symbols in place of letters and words. Writing became an important feature of these new civilizations. People used writing to keep accurate records and to preserve stories. Civilizations also created art for enjoyment and practical purposes. Artists created paintings and sculptures portraying gods and forces of nature. People designed massive buildings that served as places of worship or burial tombs for kings.